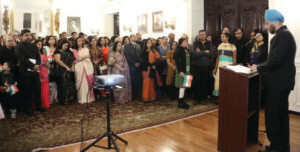 Ambassador Navtej Sarna reads out the Republic Day message of President Pranab Mukherjee at Republic Day celebrations at the Embassy of India in Washington, D.C., Jan. 26. 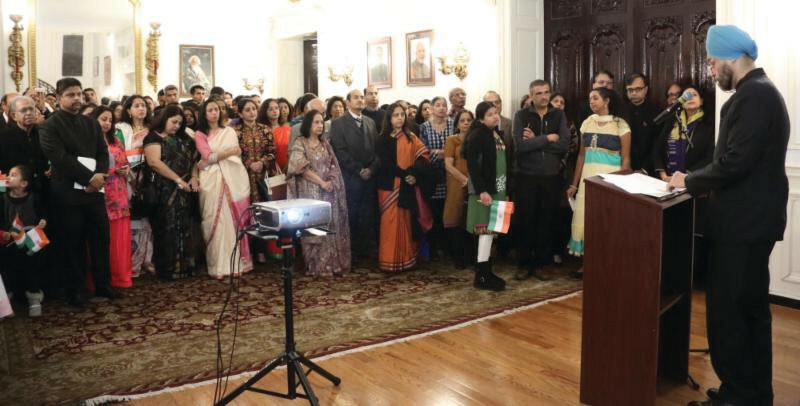 The Embassy of India in Washington, D.C. observed India’s 68th Republic Day at its premises. Ambassador Navtej Sarna paid floral tribute to the statue of Mahatma Gandhi in front of the Embassy, after which he unfurled the national flag. Ambassador Sarna addressed the guests and read out the address by Indian President Pranab Mukherjee. This was followed by singing of patriotic songs by a young Indian American. Over 200 members of the Indian-American community attended the celebrations. Documentaries titled “A Day in the Life of India” and “INDIAN ARMY: An Instrument of National Power” were screened on the occasion.